“CTI-Creative Technologies Israel Ltd, which seeks Brazilian funding, is a company located in the illegal Israeli settlement of Gilo in occupied East Jerusalem, just north of the ancient Palestinian town of Bethlehem in the occupied West Bank. This large settlement with some 30,000 Israeli inhabitants was built on illegally expropriated and annexed Palestinian land and destroys the livelihoods of many Palestinian communities in the area. Brazil must not provide funds or other support to CTI-Creative Technologies, if Brazil wants to prevent the expansion of the Gilo settlement and protect the rights of the Palestinian people." 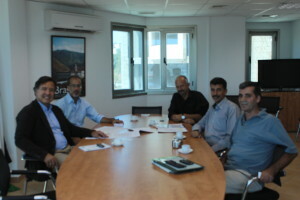 The delegation – comprised of of Zakaria Odeh (coordinator of the Civic Coalition for the Defense of Palestinian Rights in Jerusalem), Jamal Juma’ (coordinator of the Stop the Wall Campaign) and Salah Khawajah (spokesperson of the National and Islamic Forces, the coordination body of Palestinian political parties) - expressed congratulations to H.E. Luiz Alberto Figueiredo Machado for his appointment as minister of foreign affairs and handed over a joint letter.